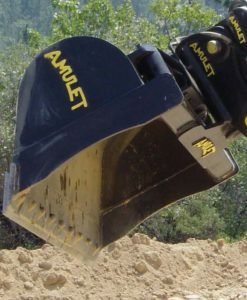 The Amulet Tilt Bucket is a full-featured hydraulically tilting bucket for backhoes and excavators. The Amulet Tilt bucket or Ditching Bucket is a both a grading and a shaping tool. Optional abrasion-resistant side cutters and a heavy-duty cutting edge increase bucket rigidity, durability and wear. Induction-hardened pivot pins mounted through large bushed surfaces maximize wearability. 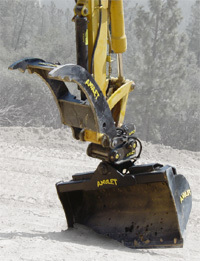 Amulet’s tilt bucket tilts 45 degrees each way and has heavy duty, double-acting hydraulic cylinders. 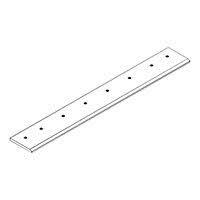 Replaceable bolt-on edges are available for all Amulet Tilt Bucket models. 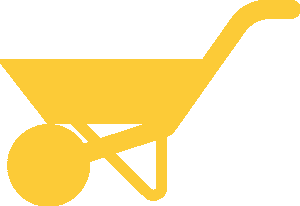 – For Backhoes from 2,000 lb. to Excavators 100,000 lb. 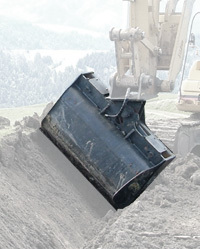 – Bucket for V-Ditching and Sloping. – Bucket tilts 45 degrees each way. – Full 90 degree range of tilt. – Standard side taper for bucket clearance. – Heavy duty double-acting hydraulic cylinders. – Twin cylinders come complete with bucket hose kit. 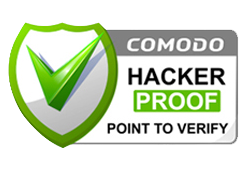 – Wear strips fitted as standard features. 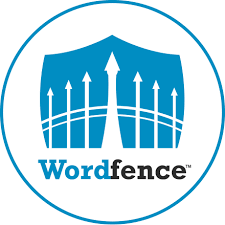 Include your carrier model brand and type when inquiring/ordering. Hydraulic bucket tilts 45 degrees in two directions. A grading bucket and a shaping tool. Optional abrasion-resistant side cutters and heavy-duty cutting edges available. Induction-hardened pivot pins mounted through large bushed surfaces maximize wearability. Free Shipping to USA mainland and parts of Canada. Use GetQuote for other locations.